A Kickstarter Feature: Two Rooms and a Boom! It's not a secret that we here at TOG we are HUGE fans of The Resistance, and every once in a while there is a game that comes along claiming to be able to topple The Resistance from its pedestal. In recent months Two Rooms and a Boom has been getting a ton of social media, podcast, and bloggy love, and while it has many similarities to games like Mafia, Werewolf, and The Resistance, there are some very intriguing differences that could make this one stand out from the crowd! Keep in mind that I have yet to play 2R1B yet, which hopefully won't be the case for long. But here's the info I've gathered from around the interwebs and various podcasts. Much like games of this type, each player is randomly given a secret role, which determines which team they are on; the blue will have the president, and the other team has the bomber. Players are divided into two groups (or rooms) and the game consists of 5 timed rounds. At the end of each round the two rooms exchange people. The goal of the red team is to get the bomber in with the president at the end of round 5, thus blowing up the president. The blue team's goal is to save the president. Unlike games of this type, players are allowed to ask other players to see their identity card, so more information becomes available as the game moves along. And because the rounds are timed, there is a finite play time for each game. And what secret identity game would be complete without special role cards? Well 2R1B boasts over 150 special roles! That's not a typo! 150! Needless to say the replay value of this one should be sky high. Despite being a Print and Play favorite for some time, the Kickstarter campaign funded within the first 6 hours, and is currently barreling down on the 300% funded mark, and they have unlocked 8 stretch goals, with more to come. You can check out the campaign, which ends Nov. 29, and download the print and play files RIGHT HERE! If you want to back the project, it's only $20 to jump on board! So are you backing this? Have you played it? Will it end the reign of The Resistance? Let us know in the comments below! And don't forget to look for us on Facebook, Twitter, Instagram and YouTube. Oh, and check out our Podcast for a chance to win a copy of Pixel Lincoln! What's Better Than New Board Games? UPDATE: It's over now. That'll teach you not to read our emails right away! Today's Gold Box Deal from the folks over at Amazon features a number great board game titles, and a number of well...not-so-great board game titles. All of the titles are about 40% off! That's right you can get The Resistance for $11.99!! Check out the great deals here! It's over now. Stop clicking things! So stock up on all those classics that might be missing from your collection! Thanks for reading. Are you picking anything up from this sale? Let us know! And as always we appreciate your subscription to the blog! This Friday, June 21st from 7-11 will be a night of tabletop gaming at the Root Cafe, hosted by me: Jeremiah Isley. This will be our second monthly meeting and I'm working away in the background for a few special surprises, so stay tuned for more information there! The Root Cafe, is a great little coffee shop in Cuyahoga Falls, Ohio. My wife and I go there often to relax, chat, and write, and through our frequent visits we've gotten to know the manager, Karolyn, fairly well. The Root is packed with great atmosphere, delicious beverages, and some great tables for gaming! I pitched the idea of a game night to Karolyn and she was all for it! What we're hoping to accomplish with these gatherings is to introduce the hobby to folks who may think of Monopoly when you mention board games, and also give folks who are into the hobby a fun, relaxed, welcoming atmosphere to enjoy their gaming and the chance to meet other folks in the area who share the same interests. I would love to meet you, and game with you; if you're nearby please come on out! The Root is located at - 852 W Bath Rd, Cuyahoga Falls, OH. You can find out more about the Root Cafe here. Thanks so much for reading, check back soon for more coverage from Origins Game Fair—or better yet subscribe over on the right for our emails! And don't forget, we're on Facebook, Twitter, and Instagram! By Firestone A number of months ago we told you about TableTop, Wil Wheaton's Internet board game show. Well, the latest show has them playing my favorite game: The Resistance. If you've wondered what is so great about this game, this is a great chance to watch a group of people actually playing. You'll see paranoia, accusations, mistakes, subterfuge, and all of the others things that make me love this game so much—and they aren't even particularly good at it! Be aware: They do occasionally curse. Some of the "big ones" are bleeped out. Others aren't. By Firestone I love expansions. LOVE THEM. Sometimes they can "fix" some of the problems that emerged in a game when it first came out. Sometimes they can just breathe some new life into a game that has grown a little stale. Sometimes they allow more players to play the game (although this is rarely a good thing, IMHO). Card games are a natural fit for expansions. Thunderstone, Nightfall, Netrunner, and Lord of the Rings all benefit from just more awesome stuff to add! Pandemic's On The Brink added some significant gameplay changes—including someone playing as the baddie! Those are the most risky expansions, because they have the potential to be awesome or terrible. But sometimes expansions are just...awful. The first one that springs to mind is the expansion for The Princes of Florence. Now understand: For years and years and years Princes Of Florence was my very favorite game. It was only recently eclipsed by The Resistance, due to the sheer amount of fun I've had with it. So I was excited to play with the expansion that came in the Treasure Chest (one box that had 10 expansions for six games). It. Was. Horrible. Our one and only game using the expansion took 4 hours. 4 HOURS!! Toward the end of that game, the expansion made me hate Princes Of Florence. Any expansion that makes me hate my favorite game is bad, bad, bad. So what are some of your favorite expansions? And what are some that fell flat for you? Welcome to Kickstart Weekly! We're toying around with the schedule for this post so today, you get it on a Saturday! Enjoy! Coup - The Resistance - Indie Boards and Cards is currently launching a Resistance themed version of Coup, a card game of bluffing, and deception! If you've been reading TOG for any amount of time you know that we're big fans of The Resistance titles and are looking forward to yet another addition to the franchise! Check out the campaign here, you can jump in and get a copy of the game fairly inexpensively! Greater Than Games - Galactic Strike Force: The Cooperative Deck Building Game The same folks who brought you Sentinels of the Multiverse are bringing you another deckbuiler, this one is set in a sci-fi universe in which players are working together towards a common goal. The game looks cool, and GTG has a great track record of bringing quality games to market. Follow this link for their Kickstarter Campaign. Ares Games - Galaxy Defenders, a co-op miniatures game. Another sci-fi co-op game, this time using miniatures players will fend off an intergalactic invasion! The miniature prototypes displayed on the campaign are looking slick! We don't usually cover miniatures games, but this one looks like it breaks out of the typical genre box. You'll find out more right here. Pixel Lincoln Playing Cards Funded!! Our good friend Jason Tagmire and his pixelated pal along with the good folks over at Game Salute, have done it again, the Pixel Lincoln themed Bicycle deck has funded and they managed to knock off a few stretch goals along the way! Congrats, to Jason, Game Salute, and Pixel Lincoln! Find out more here! And read our most recent interview with Jason here! This game crushed it's campaign bringing in over half a million! A big congrats to David Malki and the gang for hitting another home run with their twisted concept of fate, and death. Best of luck! See what the hub-bub is about right here! And read our interview with David right here. Thanks so much for reading, and have a great weekend everyone! If you want more fun and info from TOG check us out on Facebook and Twitter! This is a special interview for me (Firestone). Jared and Shane are the designers of the new game Walk The Plank, which you can find on Kickstarter here. But more than that, they’re members of my own game group, and friends. I’m thrilled they agreed to let us interview them. So tell us a little about yourselves. J—I spend a good chunk of my time playing games or studying and dissecting games to better understand their inner workings. When I’m not playing or designing games, I find myself interested in other creative pursuits such as programming or cooking. S—What would you like to know? Born and raised Colorado native. Spend most of my time working, sleeping, or gaming. On occasion I’ll go outside, but the sun is not my friend. How did you guys get started playing these type of games? J—I’ve been a gamer all my life. This was mostly limited to video games until a college buddy introduced me to the local boardgame store and I’ve been hooked ever since. I still love digital games, but board games offer something different, and it’s awesome to have such a wide variety of games available to explore. S—I started playing board games with my family when I was a little kid. The usual classics, and as I got older I spent a lot of time by myself playing board games and video games. When you switched schools every year as I did from 2nd through 6th grade, it’s hard to keep friends. So I really got into gaming and it just grew from there. How did Walk The Plank come about? S—I had a dream. It was about pirates all trying to shove each other off the plank. It seemed like it would be a cool game, so I came up with a quick, and pretty much all random, dice game. I showed it to Jared, and with his help it turned into a much better and way-more-fun design. J—Shane came up with the core idea near Talk Like a Pirate Day 2007. Shane’s initial game was mechanically weak, but I loved the concept. So, drawing on our experience from other games, we worked together to find better mechanics to truly make the concept shine. What was the process for getting it published? S—To be honest, most of that was on Jared. He pushed for getting it published, and so I'll let him tell the tale. J—We’d had some prior interest from Indie Boards & Cards, but they decided to pass. We also got a narrow 2nd place in a design contest run by Rio Grande. It was clear people really liked the game from this interest and our playtests, but we didn’t have the time and resources to pursue it further. I was fortunate enough to have a chance to go to Origins 2012—my first gaming convention. Making sure not to squander this opportunity, I printed up several spec sheets for the game, planning on presenting the game to as many publishers as possible. I was nervous and not really sure where to start; I’d already been chatting with the people at the Mayday booth a bit, so I decided to start there. I met Seth, the owner of Mayday Games, shortly thereafter and showed him Walk the Plank. He was interested right from the start; the game fit perfectly into Mayday’s product line, and he found the theme and mechanics a lot of fun. A little later I had a chance to play a full game with Seth and his son—and he loved it. Two days later I had a contract in my inbox. Are there any other games you guys are working on? S—I haven’t worked on any others with Jared, but there are always game ideas in the works. None that have turned out to be worth showing off yet. The closest I got to one I thought was playable, but haven’t finished, was my attempt at a dice game. I didn’t look to see if anyone else has done it yet, but after talking with another guy from our group, Devin, we decided there needs to be an Oregon Trail Dice game. If anyone wants to give it a go, let me know. J—As Shane said we aren’t currently working on anything else together, but I have a handful of designs in progress. Several have interesting mechanics or concepts, but I don’t currently have anything I’m happy enough with to start playtesting heavily. I’d like to have a 2nd finished design within the next 1-2 years, so we’ll see what comes to pass. What are your five favorite games right now? And what do you like about them? J—My all-time favorites would probably be Time’s Up, Crokinole, Mao, Galaxy Trucker, and Liar’s Dice. The 5 I’m currently most interested in would be Hanabi, Article 27, The Resistance, Time’s Up, and Tzolk’in. Hanabi is an amazing cooperative game of deduction with a lot of room for clever plays. Article 27 I’ve only had the chance to play once, but it’s such a pure and elegant negotiation game that I’m very enthusiastic about trying it more. The Resistance continues to be a fantastic team game of deduction, though I wish it wasn’t so heavily biased in the spies’ favor. Time’s Up is always a blast and it’s just a great feeling to be in that zone where you and your teammate are in synch, nailing card after card. Tzolk’in deserves the hype and the gears aren’t just a gimmick—a fresh and interesting take on worker placement with a strong back-end to support it. S—Favorite anything for me changes on a daily basis, but if I had to list them off the top of my head I’d do so in this order: Galaxy Trucker, Twilight Imperium 3rd Ed., Space Alert, Merchants & Marauders, and Ghost Stories. I love games with theme. I don’t care how long it takes to play as long as I can immerse myself in the story. Jared, I know you’re a big Time’s Up! fan—having played many, many games with you. What’s your favorite Time’s Up memory? So many to choose from! Probably the most recent great memory was the ferocious dinosaur-beast known as Winnie the Pooh... Other classics include the inability for anyone to remember Mr. E. Lee’s first name, Buzz Lightyear the Nazi, and of course Maya Angelou the fighter plane. Shane, you’re a big Vlaada Chvatil fan. What is it you like about his games so much? He is my favorite designer. Why? Theme and mechanics. I find most of his games just grab my imagination. And most of his designs are very different, so you can play several and know that each is its own game. I haven’t found one yet that I didn’t enjoy. What upcoming games are you most looking forward to? S—There’s a lot coming out lately that I want. I can’t wait for Zombicide Season 2, looking forward to trying Sails of Glory, and Star Trek: Attack Wing, to name a few. J—I’m cautiously optimistic toward Bora Bora—I haven’t especially liked a lot of Feld’s recent games but I like what I’ve heard of the mechanics so far. Compounded looks interesting simply because I like alchemical themes. Beyond that, I’m sure there are plenty of other interesting titles coming out within the next year—I just don’t know about them yet! Best thing about Babylon 5? Worst thing about Babylon 5? The Cheat or the Poopsmith? J—Does the Poopsmith perform lightswitch raves? I didn’t think so. S—Is this where I’m supposed to say bird? I’ll play your game and say bird. Thanks to Jared and Shane for answering our questions! 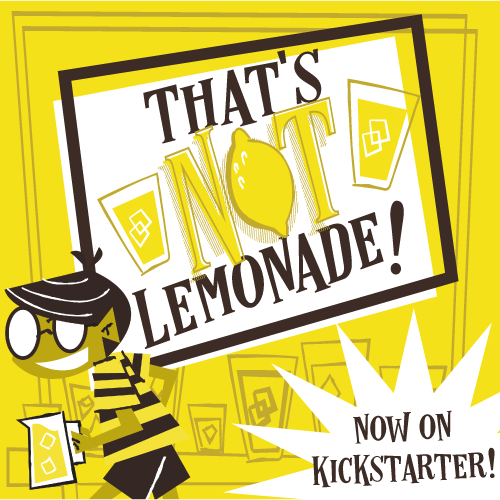 And go check out the Kickstarter campaign! There's less than a week to go; trust me: This is a really fun game. Well, we're back from Indiana, and trying to put out fires and get caught up. It was so busy that we only had time to play a couple of games of The Resistance: Avalon—at 1 in the morning at the hotel Starbucks. But at least we got to play! The Best Board Games of 2012! 9. Lords Of Waterdeep—This is a worker placement game with a thick veneer of fantasy to it. There's a fair bit of mess-with-your-neighbor-ness to it, but I was okay with it. 8. Smash Up—A card-battling, shuffle-building game, featuring different factions that you can combine to smash up one of several bases on the table. Light rules, cool cards, and fun faction combos. Check out our review here. 7. Plato 3000—This was a surprisingly fun little filler! It's basically rummy with special powers—if you can snag a copy, you should do so! You can read the review here. 6. Gauntlet Of Fools—This is another filler that grabbed our attention. You grab your hapless hero and head into the dungeon, where you'll almost certainly die. Sounds fun, right?! Well it really, really is. Read our detailed thoughts on it here. 5. Star Wars: X-Wing Miniatures Game—The minis are way cool. The gameplay is fast and fun. AND IT'S STAR WARS! This is the kind of game I expect to sink a ton of cash into, but the looks on my kids' faces when we play makes it worth it. Here's our review of this terrific game. 4. Android: Netrunner—The first of two LCGs on the list is a remake of the classic CCG from the 90s. This reboot is excellent. The key is the asymmetrical play—with one playing the powerful corporation and the other playing the plucky, tricky hacker. This has so much potential for interesting expansions...I can hear my wallet screaming now... Here's our review. 3. Star Wars Card Game—This is the start of something really great; the base set is already climbing to the top of our lists, and they haven't yet expanded it for 4 players. With the unique Edge Battle mechanic, paired up with some pretty awesome card artwork, the sky is the limit for this LCG. We're really looking forward to what Fantasy Flight has in store. In the meantime, check out Jeremiah's review. 2. Tzolk'in—I can't remember the last time I was this enamored with a game. Rather than gush over it here, I'll just point you to my review. 1. The Resistance: Avalon—What can we say about this game that we haven't already? The Resistance is one of our favorite titles of all time, and Avalon adds just enough variance and depth to keep us coming back for more back-stabbing, lying, skulduggery and intrigue. The new/optional roles have increased re-playability even more. Read our review here; then go get the game. Now. What are you waiting for?! So what did you think were the best games of last year? Let us know in the comments, and make sure you "Like" us on Facebook. And over on Twitter too!